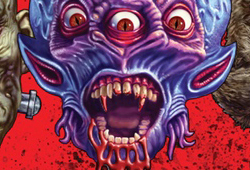 2017 Sidekick Labs Creeping Flesh trading cards spotlight the monster artwork of Dan Brereton. Packaged as a premium pack-style factory set, there are both retro and modern elements. The main 2017 Sidekick Labs Creeping Flesh trading cards set has 19 cards plus one sticker. These are printed on retro-style chip card stock. Further adding to the old-school feel is the fact that they come packaged in a wax wrapper, a Sidekick Labs specialty. Brereton’s resumé spans several comic publishers, big and small. Titles and characters he’s worked with include The Nocturnals, Batman, Vampirella and even The Simpsons. All pledge levels of $20 and up come with one of the premium wax packs with the full set. Those who pledge more towards the product can unlock addition rewards. The include an exclusive metal card signed by Brereton, sketch cards and an 11 x 14 print. Further items can be purchased as add-ons. Among these are autographed single cards and complete sets, a custom display frame and unfolded wrappers. • Funding Goal: $1,000 — the funding goal has been reached so the project will be funded and move forward.